Creating a brand mascot (well) is not as easy as it may seem. Humour and memorable characters sell. People look more favourably upon a brand if they’re entertained by an enthusiastic and loveable fictional being, rather than being educated by professional and knowledgeable humans. It’s true, a brand character somehow seems more authentic. No one wants to hear from boring CEO’s and business owners (Steve Jobs and Richard Branson are rare exceptions). Can you imagine walking down the street in your company tee trying to get selfies, hugs and high fives from people passing by? Good luck. Over a three part series we’re going to explore a few amazing mascot success stories (and failings) and give some pointers on creating a brand mascot, and marketing with them effectively. Creating a successful brand mascot is no rush job, and wherever you can seek advice or input from professional marketers, you should do so. When you choose the right spokescreature and craft their personality to perfection, they can be enormously beneficial to your business. 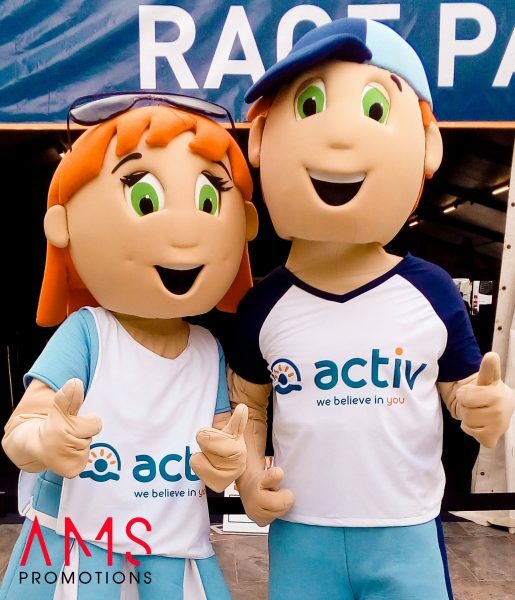 Mascots enable your target audience to better understand and remember your company, and help them identify with your brand. So, how do you create your own celebrity to star in your brand story? Here are some tips on choosing a timeless advocate for your company who will never quit (unless you write it into their script), take holidays, or (unlike real celebrities) possibly engage in cringeworthy public blunders that could be damaging to your brand. Consider all aspects of your business. Do you have a snappy slogan that works? Think about what type of creature/thing/character would best deliver that slogan, and what sort of voice they should have. If your message is dated, perhaps you could create a new catchphrase to accompany your new mascot. Is your brand personality fun and friendly, or tough and no-nonsense? It’s important to think long and hard about how you want to personify your brand. Brainstorm with your staff, and ask yourself every question you can think of. Ultimately you want to tie your brand to a theme so consumers can connect on a deeper level. Don’t go overboard, give your consumers credit, make sure your mascot is timeless, and that it makes sense. There is much more to a successful mascot than a funky name and costume. They need to have a clear personality so people can relate to them. If they speak, give them a distinctive voice. Give them a background and memorable quirks. You might have a bungee jumping mascot who’s afraid of heights. Your mascot might have favourite foods and share recipes on social media. A mascot with a tough exterior might be scared of butterflies. Be creative; but in-keeping with your brand identity. Your mascot can represent a physical aspect of your brand (think the M&M characters), or represent the company’s ideal qualities. The Aflac duck is a prime example of the latter. Aflac is an insurance company, they needed a mascot to soften their brand image and help people remember the name. The duck is a symbol of luck, nesting, calmness and awareness. A nice critter for an insurance company to be represented by. If your mascot represents your company both physically, and through encompassing brand qualities, you’ve nailed it. The energizer bunny personifies the values of the brand and product, while playing on the fable of the tortoise and the hare; all in a cute, furry, likeable manner. Winner. To get the most out of your mascot they need to be suitable for multiple design styles and channels. You want them to look great illustrated in print, animated for TV and social media, and of course when interacting mascot-to-person in a life-sized costume. We recommend starting with sketches of your mascot until you’re happy with how they look paired with your brand. If you rush out and buy a bear suit and stick it in a company t-shirt, will it be a memorable enough character on social media and in print? Likewise, a character that looks great on paper may be frightening, or over the top in costume. Try to choose something both child and adult friendly, or you may end up with more tears and fear in your mascot selfie photos than smiles and high-fives. Believe it or not, your costume doesn’t need to break the bank if it’s on-point with your brand and its persona. You can pick up acceptable budget mascot costumes from online sites for $50 – $500 and have them customised. This might be your better option if your “real life” mascot isn’t planning on making too many public appearances. Ideally, a custom made mascot costume will set you apart from the rest, and ensure you have a well designed and top quality suit. They don’t come cheap…priced anywhere between $2,000 to $12,000 depending on your design and materials, so do everything you can to ensure you’ve made the right choice. OMG. No mascot here; just an extremely unappetising character. I had to share. Burger King, what were you thinking? While those examples may have left you sufficiently terrified, don’t ditch your mascot dreams. We’re covering some stellar examples of social media mascot stars who perform an incredible service for their brands in Part 3 of this series. But first, in Part 2 we’ll delve into some ideas on how to market with your mascot effectively in face to face campaigns. See you there!